The use of some abbreviations, symbols, and dose designations has been identified as an underlying cause of serious, even fatal medication errors. 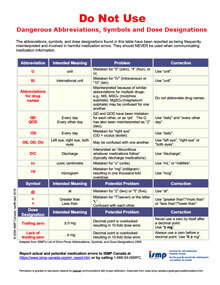 The following three examples illustrate abbreviations in common use that were involved in medication errors reported to ISMP Canada. The use of drug name abbreviations increases the likelihood of confusion between drugs with look-alike or sound-alike names. In this example, although the order was also communicated verbally, as "morphine", the widespread practice of abbreviating drug names (e.g., "morph" for "morphine") was found to be one of the contributing factors in a fatal event where hydromorphone was given instead of morphine. This example also emphasizes the need for legible handwriting. The "u", representing the whole word "units" has often been misinterpreted as a "0" (zero), leading to a 10-fold dose error. Here, the intended "6u" was misinterpreted as "60" and the patient received 60 units of regular (short-acting) insulin. Of note, insulin is the most commonly reported medication identified as causing harm in the ISMP Canada database of voluntarily reported medication errors. In this third example, an octreotide infusion was administered at 25 mL/h instead of 5 mL/h as intended. Whether handwritten or computer-generated, the "@" symbol can be misread as the number "2" or "5", leading to substantial overdoses of medication. ISMP Canada, Accreditation Canada, and the Canadian Patient Safety Institute will be undertaking joint initiatives to eliminate the use of dangerous abbreviations, symbols and dose designations in health care to enhance the safety of Canadian patients. ISMP Canada has made a variety of reporting mechanisms available to individual practitioners, including telephone or web portal electronic submission. Reports may be submitted anonymously if preferred.